3. PHONE IF your order is relatively simple or if you have a few questions, you can phone me at 718-939-5788. For me, "business hours" are flexible. I'm usually in, and if I'm not, you get the answering machine. Leave your Phone#; I'll get back to you. I NO LONGER ACCEPT CREDIT CARDS OVER THE PHONE, but I can set up a special "lot" for you on my website and you can enter your CC Information on my shopping cart. In German, das gift means "the poison", and the United States Postal Service ended 2017 with a few "gifts" to us all. These "gifts" consisted of a few changes to the mailing regulations... changes which will cost us all, some worse than others. Now, these changes were effective as of January 21, but if you haven't heard about them -- or should I say, suffered by them -- it's only because, in typical USPS style, they're rolling out slowly. The large, heavily-trafficked Post Offices like mine are already operating under these changes, but many of the smaller, lightly-trafficked Post Offices are still operating under the old rules. You may have read an article late last year in Linn's about how the old Black (under $500) and Blue (over $500) Insurance Labels were discontinued. It appeared a few months ago. Now, each package must be provided with a barcode (the Postal Clerk sticks these barcode labels on the packages), and scanned into the "system". You get FREE TRACKING along with the insurance. Well, you know that old adage, "If it sounds too good to be true, it probably is." First, this isn't free at all. Last year, it cost $2.85 to mail a 5 oz Parcel (which would be one of my medium-size Calumet Mailers). Today, the same Parcel costs $3.75. Doesn't sound free to me. Second, USPS Insurance is no longer available for First Class Letters. Only for Packages. This is the kick in the guts. Last year, we could mail a $50 stamp in a small-size Calumet mailer, First Class, 3 oz, for $1.12, and insure it for $2.10. Today, the insurance STILL costs $2.10... but it must be mailed as a "Package". A 3 oz package costs $3.50. You understand, the only difference between a 3 oz Letter and a 3 oz. Package is the name. It's the same weight, and the same mailer... but now it's called a Package, and costs $2.38 MORE to mail. We're being ripped. Consider the above 3-oz Calumet mailer. First Class LETTER to Germany (and many other countries), $3.33. But First Class PACKAGE to Germany, $14.00. Here's a link to the USPS Calculator for International Mail. If the situation with U.S. mail can be called a "kick in the guts", then this situation is a kick in a much more sensitive area. THE QUESTION, NOW, IS "WHAT ARE WE GOING TO DO ABOUT THIS?". And by "WE" I mean ME, as the shipper, and YOU as the shippee. I've always been very conservative in my shipping charges, and I plan on keeping them as low as possible, but given the recent USPS changes, I'll have to come up with something almost miraculous to avoid raising them. By this I mean, I'll have to do some research and come up with a scheme... and by that I mean a LEGAL scheme, because I'm too old to start anything ILLegal...like shipping merchandise Internationally without Customs Forms. That's off the table. One scheme I've been thinking about involves mailing with certain modern U.S. Stamps which have a fairly high value when postally used...like the 1992 Columbian Reprints. The KEY to this scheme is their recovery. I need to come up with a "system of compensation" which will induce enough of you to participate in this program to make it effective. ...and you can start saving the stamps I'm using to send your orders. One way or another, this will prove profitable to you. And now, let's get down to business. I've been selling these FDCs for about 35 years; they came to me in 1981 as part of the lot which started me in the field of U.S. 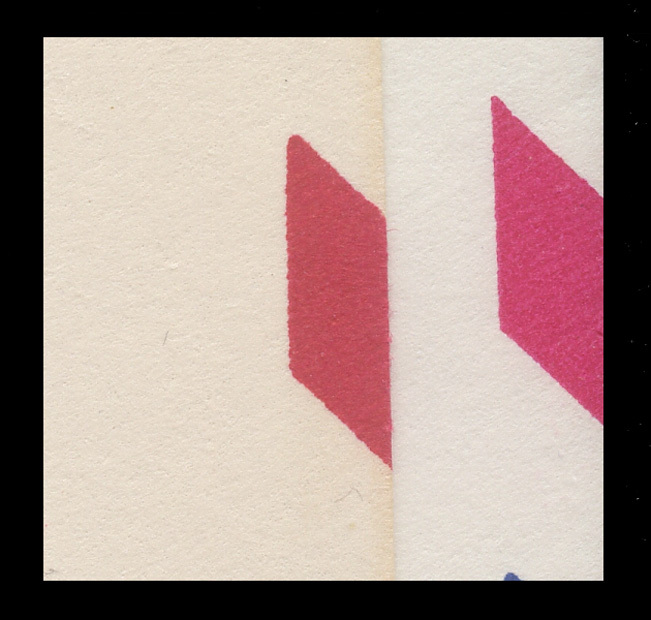 Postal Stationery. They were part of the Estate of Richard Brumbaugh, dba Paradise Stamp Company. He lived in Washington, D.C. and worked for the Department of Labor by day... and was a part-time Stamp Dealer by night. He haunted the Philatelic Agency (and probably still does! ), and when anything unusual was released, he'd be there to pounce on it. 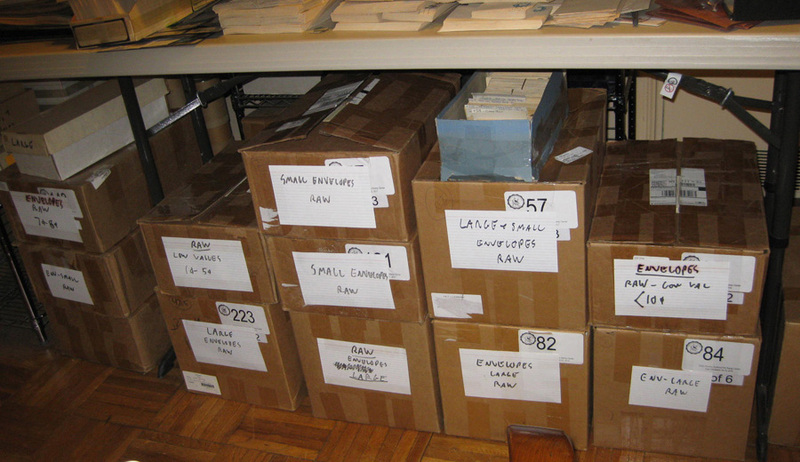 During the 1960s, as the USPOD was moving into a more automated age through the use of luminescent (tagged) stamps and envelopes, he put together a stock of tagged items second only to Alfred ("Tag") Boerger. 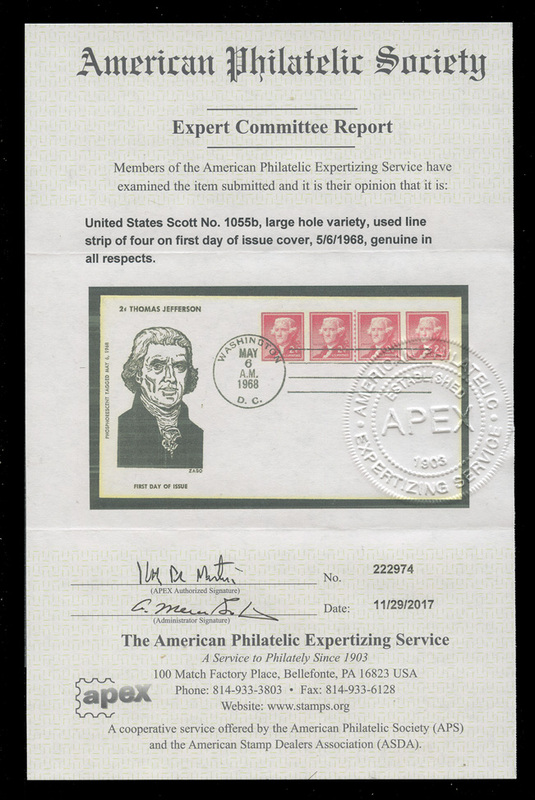 Up until last year, I assumed these were just FDCs of what was formerly called 1055a, the tagged FDCs, priced in Scott/Mellone at $40.00 for a pair, NO PRICE given for a line pair or strip. Back in 1981, the Large Hole/Small Hole varieties of the Liberty Coils weren't on the radar. Frankly, I don't know when they were first listed, nor do I know when the Wet Printing/Dry Printing vaieties were first listed. I was in a different corner of the world, specializing in U.S. Post al Stationery, and not paying much attention to what was happening in the world of "stamps". So by 2017, Scott #1055a had had its number changed to 1055b. Beginning on page 186 of that issue was the story. It had taken nearly 50 YEARS for this previously unreported variety to surface. It had been sitting out there, in plain sight, but nobody knew what it was. Maybe that's because it existed only on First Day Covers. 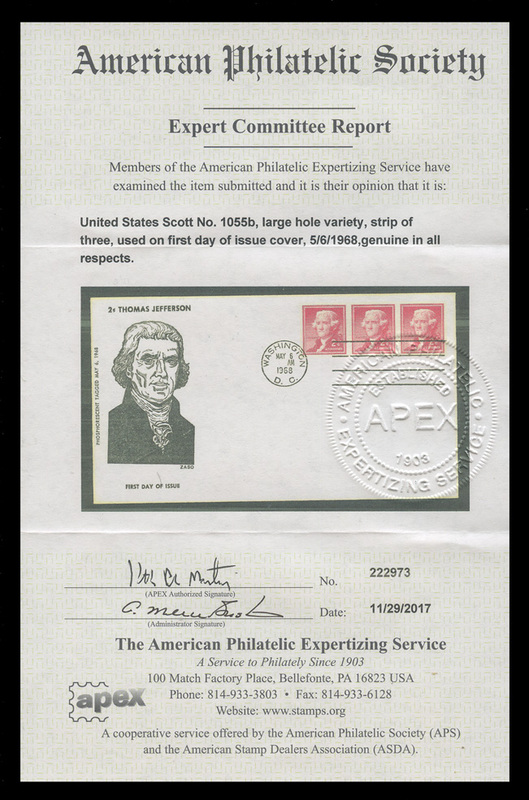 The APS issued a Certificate for a strip of 3 on a FDC. I don't know who the cachet maker was; it's a generic cachet, probably used on several issues. Later last year, I sent one Line Strip of 4 and one Strip of 3 to the APS, and they both came back good, as you can see in the scans of the Certificates above. 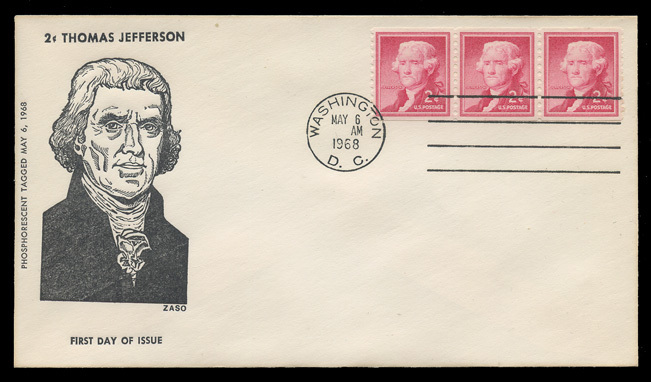 I contacted a few very knowledgeable peope in the USSS to get as much of the story as I could, and was told by Ken Lawrence: "I believe the late printing of the 2¢ Jefferson coil was to fill a special order for low-denomination stamps used on return envelopes in fund appeal mailings by Disabled American Veterans, after tagging had extended to all regular issues. It was not an intentional new stamp, nor was it considered one at the BEP, but it was an unannounced surprise to hobbyists. That's similar to the famous tagged 3¢ Liberty coil, printed to fill a special order for LOOK magazine, also unintentionally a new variety, also unannounced." I wish I had a gazillion of these, but I don't. So please, get to me quickly, and don't pass this one up. The APS Certificates are NOT included. 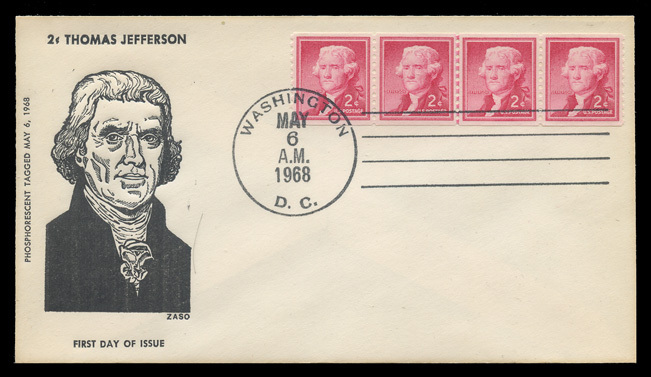 Price for a Strip of 3 on FDC is $40.00. Price for a Plate # Strip of 4 on FDC is $100.00. Since my last mailing, I've made a few updates to my Website listings! My USED Postal Card section has been expanded. I've added the listings from UX24 to UX92. Plenty more to come. And finally, I've made some progress on my UPSS Envelopes listings. I'm now working the AIRMAIL (UC1-47) section. SO FAR, I've managed to get most of the small sizes listed. The rest of the small sizes and hopefully, the large sizes will be listed by my next mailing. CLICK HERE TO ACCESS MY "UC1-47 by UPSS# SECTION. That's all for now. The APS listings are going slowly because I have a lot of material to go thru. Last mailing, I included the picture at the right, and I see no reason not to show it to you again...because it hasn't changed much! There's a lot to be done, thanks in part to the hard work of some of the UPSS honchos, like Dan Undersander, the Editor of the UPSS Envelope Catalog. In days long gone by, I noticed that both UC37 and UC40 existed with different-colored borders. Please see the scan at the left. It's not a BIG deal, like the difference between, say U294 and U295... but at that time, nobody seemed interested, including the people who were responsible for the UPSS 20th Century Envelope Catalog. Finally, though, these varieties are given a "mention" (thanks to Dan) in the catalog, though not listings with numbers. A quick look thru my stock tells me that I have some of these. A quick look thru the boxes at the right tells me that I have several hours worth of work ahead of me to get that material identified and to re-work my listings. It is NOT likely that any of these will have a "great" value, and at this point, I don't have a handle on what exists. Some watermarks seem to exist with both color varieties; others exist only one way. So what's next? Well, I have to take care of the UC37 and UC40, then finish the rest of the airs, then maybe the Air Letter Sheets. And that's just the UPSS listings. There are still plenty of USED Postal Cards to list..and there are a few STAMPS lying around here. It won't be dull over the next few months. ©2018 Empire State Philateics, Inc.